Finally, the long dormant spot on the corner of Osborne and Stradbrook has opened its doors again. This past weekend was Black Rabbit Bistro Lounge's grand opening, so my friends and I headed over with the goal of consuming every last cocktail on the menu. It was boozy, it was fun, it was a spectacular way to pass a Saturday afternoon. The nine cocktails on the menu (plus a rotating feature drink or two) were crafted by former Bistro 7 1/4 staff Max Frank (from The Young Chefs) and Dana Gresswell. Dana tells me the list was inspired by some of the drinks they used to serve at Bistro 7 1/4 and trips to the east and west coasts. When I compliment him on the ease of the 8$ cocktail menu (yes that's right, every single one of these drinks will set you back only eight bucks), Dana confides, "We used to sell similar cocktails at Bistro 7 1/4 for eleven and up, but with the eight dollar menu, it's more accessible. We're trying to bring craft cocktails to a level that makes them less trendy and more accessible." The roundup below is of the current menu, but Max and Dana are looking forward too. "We're pricing out casks to start getting into aged cocktails. We want to make our own vermouths and tinctures. We also want to bring in more imported liquors, like different mescals, and find things that aren't typically available here. We want to introduce people to new flavours rather than rehashing old trends." All I can say is this, the flavours are great, and the 8$ menu brings craft cocktails away from infrequent indulgence and more into the realm of a regular treat. They're like that surprisingly good bottle of fifteen dollar wine - yeah you're still going to reach for the pricey stuff on occasion, but sometimes you just want something reliable and affordable. 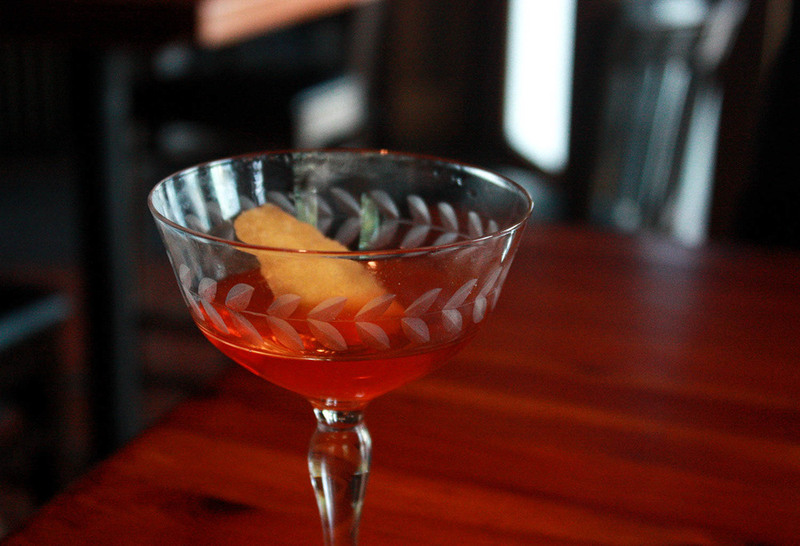 Carthusian Sazerac - Dana calls this one a true chef's cocktail, with deep flavours that you keep uncovering. It's got the slow-sipping sweetness of an old fashioned, but the addition of Chartreuse and Absinthe means that sweetness is less orange and more black licorice. Ron Fashioned - Instead of bourbon, this twist on the classic old fashioned uses 18-year-old Flor de Cana. The result is woodsy, full and warm, with a bite of muddled orange. Barrister - This drink was a favourite of mine - with a bit of fizz to add lightness and body, full sweet and spicy flavours and that lingering Campari bitterness. Hibiscus Gimlet - Sweet hibiscus is perfectly balanced with a sour finish. Cousteau Daiquiri - Bright mango and a creamy mouth feel are complimented by herbal, spicy ginger notes. Reposada Margarita - Tequila sweetness is beautifully blended with the sourness and bite of lime. The spicy kick added by the chili-salt rim puts a unique twist on this classic. Lemongrass Spritz - The lightness and bite of soda water is complimented by bright citrus flavours and a grassy finish. Lady Grey Sour - A surprisingly light drink, with a smooth texture and flavour. You'll taste those bright Cardamom notes from the Earl Grey and be left with deeper, herbal flavours. Elderflower Sour - Light and floral with a sour finish. Congrats to Black Rabbit on their opening weekend. I look forward to many more afternoons and evenings spent enjoying great cocktails and the company of friends.